Air pollution is a broad term applied to any agent (chemical, physical, biological or other) that modifies the natural characteristics of the atmosphere and has an effect on man or the environment. Worldwide air pollution is influencing the quality of life, while in addition is accounted responsible for deaths and various respiratory diseases. The definition of air pollution levels for the purpose of regulating air quality has contributed to levering the negative impacts of air pollution by improving air quality. From the end of the 19th century, and especially in the first half of the 20th century, the air pollution problem in the developed countries was characterized by high concentration levels of smoke and sulfur dioxide caused by the combustion of sulfur-containing fossil fuels such as coal for domestic and industrial use. In the second half of the 20th century, traffic related emissions became an increasing threat to clean air, accompanied by industrial emissions. As the majority of Europeans inhabit urban areas and the number of cars has increased, exhaust emissions have become a major player in urban air quality management problems. Motor vehicles emit a variety of pollutants into the atmosphere, such as carbon monoxide (CO), nitrogen oxides (NOx), volatile organic compounds (VOCs) and particulate matter (PM). Despite significant improvements in fuel and engine technology, traffic related air pollution problems are an increasing problem worldwide. Moreover, chemical reactions between nitrogen oxides (NOx) and volatile organic compounds (VOC) in the presence of sunlight leads to the formation of ozone (O3). This is a secondary pollutant that has the “tendency” to travel, thus high levels of ozone are often observed in rural areas, away from urban centers. Copied from: EEA Signals 2013 - Every breath we take. 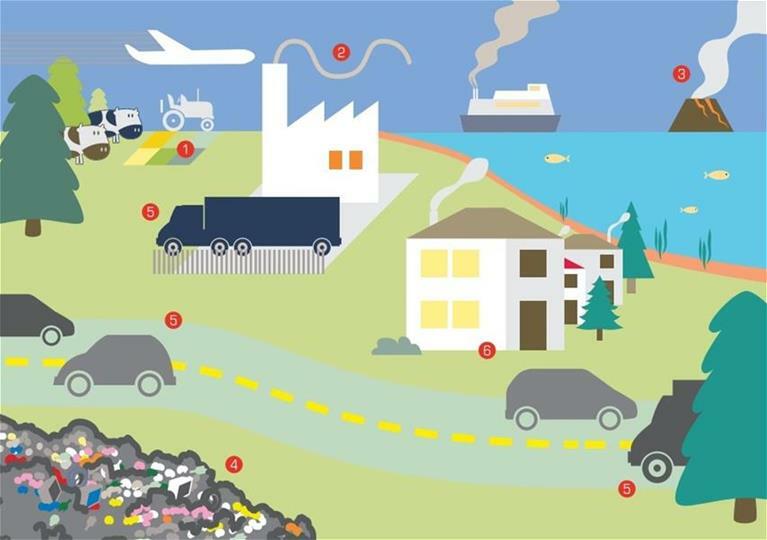 Improving air quality in Europe, European Environment Agency. Around 90 % of ammonia emissions and 80 % of methane emissions come from agricultural activities. Many natural phenomena, including volcanic eruptions and sand storms, release air pollutants into the atmosphere. Waste (landfills), coal mining and long-distance gas transmission are sources of methane. More than 40 % of emissions of nitrogen oxides come from road transport.Almost 40 % of primary PM2.5 emissions come from transport. Fuel combustion is a key contributor to air pollution - from road transport, households to energy use and production. Businesses, public buildings and households contribute to around half of the PM2.5 and carbon monoxide emissions. The sources for these compounds in Cyprus vary. Power plants and other industry is the dominating source for Nitrogen oxides and Sulphur dioxide, while traffic contributes substantially to the production of Nitrogen oxides and particulate matter [1, 2]. Benzene is a typical traffic related pollutant, together with Carbon monoxide. In addition to these compounds, ground level Ozone is a problem in Cyprus, especially in high, elevated areas like the Troodos Mountain. The sources here are mostly long ranged transboundary pollution from other countries. A similar mechanism is responsible for the transportation of Particulate Matter: Cyprus is heavily influenced by Sahara dust storms, that cause elevated PM concentrations . The highest concentration values are usually occurring as the consequence of emissions at ground level and meteorological and topographic conditions that support air pollution accumulation and low dilution-dispersion. More information on air pollutants may be found in the subsequent web pages. A synopsis is the air quality status in Cyprus is available via a relevan fact sheet of the European Environment Agency. A number of short films concerning air pollution are available via various organisations like the European Environment Agency (link and the Environmental Protection Agency of USA (link). The term "Nitrogen Oxides" (NOX) is used to describe two gases; Nitric Oxide or Nitrogen Monoxide (NO) which is a colorless, odorless gas and Nitrogen Dioxide (NO2), which is a reddish-brown gas with a pungent odor. Nitric oxide reacts with Oxygen or Ozone in the air to form Nitrogen Dioxide. Other oxides of nitrogen include NO3 (nitrogen trioxide), N2O (nitrous oxide), N2O4 (Dinitrogen Tetraoxide) and N2O5 (Dinitrogen Pentoxide). Nitrous oxide is a potent greenhouse gas and also causes damage to the ozone layer. N2O4 is very unstable, usually only present in significant quantities at night (it is dissociated by sunlight). Nitrogen dioxide (NO2) is used as an intermediate in the manufacture of nitric acid (HNO3) and also as a powerful oxidizing agent utilized in chemical processes and rocket fuels. Nitric oxide (NO) is mainly produced (and thus emitted) via high temperature burning, i.e. from the internal combustion engines and from related industrial processes. NO is also used in the manufacture of hydroxylamine, which is based on the reaction of nitric oxide with hydrogen in the presence of a catalyst. It should be noted that NOx may also be formed naturally. Major man-made releases of nitrogen oxides are primarily originating from fuel combustion, biomass burning and some production processes. Combustion processes emit (among many other releases) a mixture of nitric oxide (90%) and nitrogen dioxide (10%). The nitric oxide reacts with other chemicals in the air to become nitrogen dioxide. There are also minor natural sources such as lightning and biological processes in soils which produce nitrogen oxides. The major nitrogen gases emitted from soil micro-organisms are dinitrogen oxide (or nitrous oxide-N2O) and nitrogen (N2). The most common sulfur oxide is sulfur dioxide (SO2). Sulfur dioxide is a colorless gas with a penetrating, choking odor. It dissolves readily in water to form an acidic solution (sulfurous acid). Sulfur dioxide is a reducing agent and is used for bleaching and as a fumigant and food preservative. Large quantities of sulfur dioxide are also used in the contact process for the manufacture of sulfuric acid. It is also used in bleaching wool or straw, and as a disinfectant. Liquid sulfur dioxide has been used in purifying petroleum products. The main emission source of sulfur dioxide is the burning of fossil fuels. Power stations, oil refineries and other large industrial plants contribute to the majority of the total mass released. Domestic boilers, as well as natural sources such as active volcanoes and forest fires, release sulfur dioxide. Oxidation of other sulfur compounds (such as hydrogen sulfide) released into the atmosphere by natural and man-made processes provides another emission source. From 1970 to 1998 the amount of sulfur dioxide being released into the atmosphere annually has been reduced by 75%. This reduction was largely a result of the decreasing use of coal for power generation and its replacement by natural gas. Carbon monoxide (CO) is a colourless, odourless, poisonous gas. It is formed when fuels containing carbon are burnt in conditions where oxygen is limited. It is slightly lighter than air. Carbon monoxide can form explosive mixtures with air. Carbon monoxide was formerly widely encountered by the public as a constituent of 'town' gas - produced by roasting coal - which was used for domestic heating and even lighting since the 19th century. Carbon monoxide is the main reason for the very high toxicity of town gas. Town gas was replaced in the early 1970s by natural gas, which is mostly methane, and is very much less toxic. Poorly maintained natural gas burners may produce dangerous amounts of carbon monoxide, especially if not properly ventilated. Carbon monoxide is used for metal refining (notably nickel, using the Mond process) and as an intermediate in the production of certain chemicals. Carbon monoxide is produced when fuels containing carbon are burnt in conditions where oxygen is limited. Petrol engines are the main source of carbon monoxide. However, emissions are much lower from modern vehicles fitted with catalytic converters. Carbon monoxide concentrations in urban areas are closely related to motor traffic density and to weather conditions. Concentrations can vary greatly during the day reflecting traffic levels and speed. Vehicles produce most carbon monoxide when idling or decelerating. Other minor sources are power stations and waste incinerators. At home, faulty gas boilers may release carbon monoxide and tobacco smoking releases carbon monoxide directly into the smoker's inhaled air. Carbon monoxide is also formed in large quantities in all reducing metallurgic processes such as e.g. blast furnaces. Natural processes also produce small amounts of carbon monoxide. Ozone is a natural component of the atmosphere. Although it is a minor constituent, it is key to important atmospheric processes. Most of atmospheric Ozone can be found in the stratospheric ozone layer. This so called "good ozone", protects life from dangerous ultraviolet radiation from the sun. However, direct exposure to ozone is hazardous and the "bad ozone" in ambient air at ground level has harmful effects on human health, on plants and on materials. Ozone in ambient air is formed by chemical reactions between nitrogen oxides (NOX) and volatile organic compounds (VOC) under the influence of sunlight. Ozone concentrations can build up to high values during warm sunny days. Ozone concentrations today are much higher than a century ago due to emissions of NOX and VOC into the atmosphere from traffic, industry and other sources. Scientific research has shown that ozone, NOX and VOC can be transported over distances of hundreds or even thousands of kilometers. Under the Convention on Long-Range Transboundary Air Pollution of the United Nations, countries in Europe and North America have agreed to reduce emissions according to the terms of a number of protocols. In order to protect human health and the environment, the European Union (EU), has put relevant legislation in force, that sets targets and long-term objectives for ozone concentrations and aims at limiting the national emissions of NOX and VOC. The legislation dictates that citizens be properly informed about concentrations of ozone and other air pollutants. Therefore, the links below provide with the legal background of the EU and the ozone concentration of the most recent summer season reported of being above the legal thresholds. It should be noted that there were no exceedances for Cyprus concerning hourly Ozone concentration values for Summer 2012, while exceedances were observed for the 8-hour values. Details may be found in the web site of the European Environment Agency (link). Particulate matter (PM), also known as particle pollution, is made up of a complex mixture of many different species including dust, soot (carbon), sulphate particles, metals and inorganic salts such as sea salt and aeroallergens (polen grains and spores). 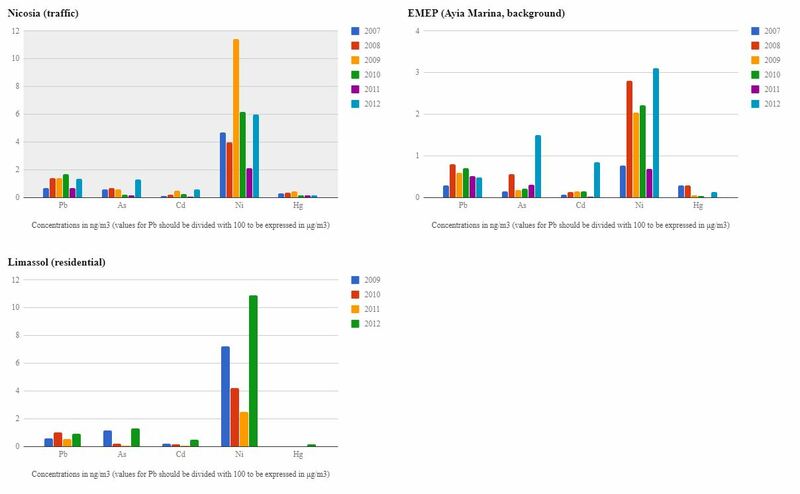 Two main pollutants are of major concern within this category: (a) PM10 which are the inhalable particulates, with a mean aerodynamic diameter less than 10 micrometers in diameter (about one-seventh the width of a strand of human hair) and (b) PM2.5 which are the fine particles, with a mean aerodynamic diameter measuring 2.5 micrometers or less. The latter particles are so small that they can become embedded in human lung tissue, causing or exacerbating respiratory diseases and cardiovascular problems. Other negative effects are reduced visibility and accelerated deterioration of buildings. PMs are generally produced as an accidental by-product of various chemical or physical processes. PMs are not deliberately manufactured, although many industrial processes do use powders and dusts as a normal input into manufacturing and processing operations. Examples include the Cement & Lime and Iron and Steel Sectors. Vehicle circulation is another major anthropogenic source of PM, while volcanic eruptions, sea salt and dust storms are the most important natural sources. Soot particles are released into the air from combustion processes like coal burning, road transport, waste incineration and other industrial processes. Sulfate particles can arise from combustion of fuel containing sulfur, either directly or by subsequent chemical reactions of sulfur dioxide with other air-borne species. Other types of particulates are created by construction and quarrying and by natural phenomena such as forest fires, volcanoes and dust storms. There are natural as well as man-made sources of Heavy Metals. Natural sources include volcanic emissions, soil erosion, dust and atmospheric particles, sea-originating aerosols, forest fires and their absorption and release by part of the flora. Man-made sources include the mining and processing of minerals, the combustion of fossil fuels, waste and biomass, vehicle emissions, as well as the use and discarding of metal products. Certain industrial processes (such as metallurgy and manufacture of metal objects, electronics, coloring substances, textiles, paper etc.) can also increase the impact of heavy metals on the environment. The results of Heavy Metal measurements (Cadmium, Arsenic, Nickel, Mercury and Lead) in Cyprus are presented in the table below. All concentrations of Heavy Metals are lower than the corresponding threshold values set by the European and Cypriot legislation. Polycyclic Aromatic Hydrocarbons (PAHs) are organic compounds which consist of at least two aromatic rings, the latter including only carbon and hydrogen. PAHs may originate from a wide array of chemical substances released into the environment by natural but also by human activities. They are insoluble in water, but soluble in fats and oils. They are often compounds located in the organic fraction of suspended particles, and are a subject of study because of the carcinogenic and mutagenic properties attributed to some of them. Some well-known PAHs include Benzo(a)pyrene, Fluoroanthene, Naphthalene and Anthracene. PAHs originate mainly from the combustion of crude oil or other fossil fuels, from the use of internal combustion engines and from the production of petroleum derivative products. They can also be produced from waste combustion. Natural sources of PAHs include forest fires and volcanic activity. PAHS have been systematically monitored in Cyprus, and the results of Benzo(a)pyrene concentration measurements are presented in the relevant charts. Overall, the comparison of the threshold values with the measured ones reveals that the average yearly values are lower than the legislated limits. It should be noted that all analyses of Benzo(a)pyrene were performed using using PM10 filter, and that the reported concentration units used are nanograms per cubic meter (ng/m3). Volatile Organic Compounds (VOCs) are chemical substances that are either in gaseous state, or may be transferred from the liquid to the gaseous state very easily, under normal temperatures. Benzene is one of those VOCs: a colorless, volatile and flammable liquid with a distinctive odor. It evaporates into the air very quickly and presents a dangerous fire hazard when exposed to heat or flame. It is only slightly soluble in water, but will mix with most organic solvents. Benzene (molecular type: C6H6) is one of the simplest organic chemicals known as "'aromatic" compounds - with their carbon atoms arranged in rings rather than chains. Benzene is primarily used as a reagent in the production of a wide variety of chemical substances, such as: dyes, detergents, coatings, plastics, fibers, pesticides, adhesives and coatings, lubricating oil additives, dry cleaning, paint and production of some types of rubber. Benzene is also found in crude oil (1-5%), gasoline and cigarette smoke. Benzene is categorized and regulated as a VOC (Volatile Organic Compound). At ground level, VOCs react with other air pollutants and contribute to the formation of potentially harmful concentrations of ozone in the lower atmosphere. Benzene is released to the environment as a result of vehicle emissions, evaporation of petrol during vehicle fueling and from fuel tanks, emissions from its production and use as a chemical reagent/intermediate and from other fossil fuel combustion. Measurements conducted in Cyprus prove that the mean annual values of Benzene are below the related limit value of 5μg/m3 .Benzene(C6H6): annual mean concentrations in Europe, The European Environment Agency. Persistent Organic Pollutants (POPs) are toxic organic compounds which exhibit high environmental persistence, bioaccumulation, transboundary transportation through atmospheric circulation, and large-scale deposition, with potentially grave consequences for the human health and the environment. As part of the effort to protect human health and the environment from the dangers of POPs, the Stockholm Convention on Persistent Organic Pollutants treaty of 2001 was created, aimed at limiting the emission of POPs and protect human health and the environment. Up to date, the treaty was signed by 152 countries, while Cyprus ratified it on the 7th of March, 2003. Polychlorinated Biphenyls (PCBs). These are chemical substances which have been used as working fluids in heat exchangers, transformers, capacitors, as paint and plastic additives, as well as additives in carbonless copy paper. They are also spontaneously formed during combustion. 1, 1, 1-trichloro-2, 2-bis (p-chlorophenyl)-ethane, also known as DDT. Its production and use is restricted. Dioxines and Furans. Dioxines is the generic name of a group of extremely toxic, polychlorinated chemical substances, produced mainly during combustion. The dioxin group consists of 75 types of PolyChlorinated Dibenzo-p-Dioxines (PCDD) and 135 types of PolyChlorinated DibenzoFurans (PCDF), commonly referred to as Furans. These substances have never been produced on a mass industrial scale, but only in laboratories for research purposes. However, they are often formed during the combustion of fuels and waste materials, as well as byproducts of several industrial processes. Dioxines exhibit bioaccumulation in human and animal fat tissue. Hexachlorobenzene and Polychlorinated Biphenyls. They are produced during the combustion of fuels and waste material, in a manner similar to Dioxines. You should always try to make rational use and consumption of energy. You can achieve this by maintaining buildings often and by replacing old equipment and devices that you have at your home/ office with new ones. You should try to reduce the use of air-conditioning and central heating in your home/ office. You should recycle paper, plastic and glass bottles to conserve energy and reduce the production of emissions. When you build a new house you should closely cooperate with all the people involved in order to make sure that correct architectural design and choice of materials are being used in order to reduce the need to use the central heating, air-condition and lighting. You should use renewable energy sources, such as solar collectors for the production of warm water or in cases that it is feasible use photovoltaics for saving electric power. Insulate your house. When you consume less energy for heating/ cooling, then the Cyprus Electric Authority will less pollute the environment. One of the best ways to reduce atmospheric pollution is to drive less! Your basic choice criterion for buying a new car should be the car’s fuel consumption, as well as whether the car is equipped with some kind of modern catalytic converter technology. Maintain vehicles on a regular basis to keep them in good shape. You should try alternative means of transportation, such as the bicycle and the public means of transportation, or you should walk more often. You should reduce uncontrolled burning, such as rubber burning and scalds, which increase dust concentrations in the atmosphere. Avoid any areas with increased traffic. Plan your activities in relation to the air quality situation. Older people, children and everyone who suffers from heart/ breathing problems should avoid going outside. The government can provide motives for replacing old cars with new ones, which are equipped with modern anti-pollutant technology. Inspection should be carried out for the cars licensed with suitability certificates from car repair shops based on a catalogue provided by the Department of Road Transport. Moreover, emphasis should be given in the catalyst performance, which will be provided in the evaluation report. The Department of Labour Inspection advices the related authorities to improve the procedure followed for measuring fume emissions from cars with diesel engines. Implement a retraction programme for the cars that are extremely polluting the atmosphere, as well as for the cars with diesel engines. Provide the public sector with cars that pollute the atmosphere less and have higher energy performance. Provide motives for replacing old diesel taxis. Import in a posterior stage, the mandatory implementation of the improved environmentally friendly cars. Implement tax fees when buying a new car as well as when renewing the circulation license for passenger cars, at least party, in accordance with the CO2 emissions in order to encourage the purchase of cleaner and energy sufficient cars. Make sure that the appropriate studies are carried out for the construction of buildings, which have as primary target energy consumption. Give motives for the purchase and installation of renewable energy source systems. Frequently clean the roads (it will contribute to the reduction of dust in the atmosphere). Implementation of training programmes for technicians of car repair shops. Inform the consumers on the energy related action of devices. Often inform the public through the mass media (radio, internet, television, etc.) on the results of the actions that the government takes in order to reduce atmospheric pollution. Upgrade environmental education for all age groups (elementary school – gymnasium – lyceum). The quality of breathed air is influenced by any substance that affects it's physical, chemical and biological properties. In the case of the latter, biological factors like pollen grains or fungus spores have been found to cause allergic reactions to sensitized part of the population, and thus influencing their health status and affecting their quality of life. It should be underlined that the aforementioned biological factors are not listed in any of the legal texts and regulations related to air quality monitoring and management in Europe, nevertheless they affect a large portion of the European population. For this reason, pollen monitoring activities and networks have been established in various European countries (http://www.polleninfo.org/), while there is no such initiative yet in Cyprus.